Here's a lightly used GPS disciplined master clock unit with IRIG-B, Serial and 1 PPS outputs as well as Options 91 and 94 (see below), that's in very good cosmetic condition. The unit comes with a power cord attached and a basic indoor antenna so it will acquire time for you right out of the box (when the antenna has a clear view of the sky when placed outdoors - indoor performance by a window is not guaranteed). The included antenna is intended to get you started and to allow you to check out the unit the day it arrives. A weatherproof external antenna with a full view of the sky is recommended for a permanent installation and for achieving the highest level of time accuracy as the unit will need to track 4+ satellites to achieve this - and I usually have some listed separately that would be ideal. Feel free to ask if you need a recommendation. 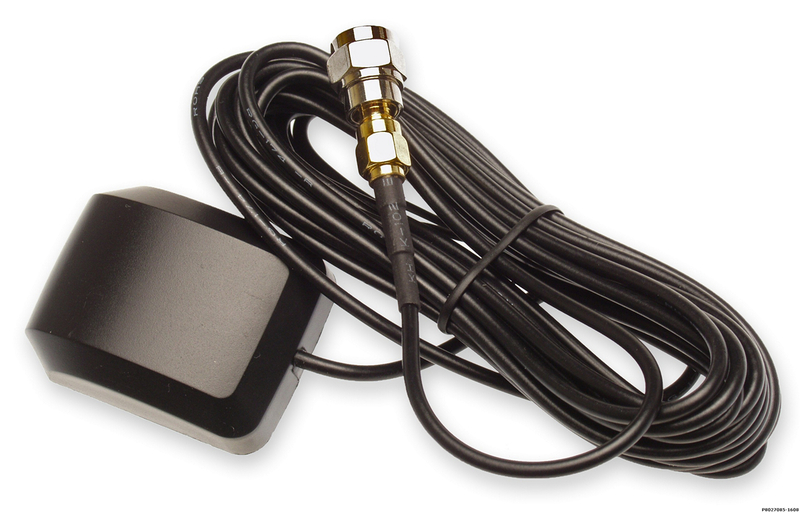 Alternatively you can choose your own antenna as any 5V L1 antenna should work well. The firmware is the latest version available at the time of listing so you're running the most recent spec and won't have to worry about compliance with the 2007 DST changes or recent leap second additions. This unit has an M12 GPS receiver card which should be good for the forseeable future. This is important as some earlier cards do not operate correctly in this chassis. Rack ears are included as shown. Option 94: Provides RS-422/485 line driver output at the standard serial port with the standard RS-232 output. See serial-port technical information in Model 192/1093 User Manual, Section 2 for pin locations. The Arbiter Systems Inc. Model 1093B GPS Satellite-Controlled Clock is a GPS timing source for applications requiring an accurate time source with a better than 500ns accuracy. The Model 1093B features an LCD setup/status display and a keyboard for ease of inspection, configuration and operation. Two pluggable terminal strip outputs provide unmodulated IRIG-B and 1 PPS. These outputs have substantial drive capability to easily drive multiple loads in parallel. These outputs are configurable to provide other output signals or an event-capture input. The power supply requirements are universal, accepting 85 to 264 VAC or 110 to 350 VDC connected by a standard IEC-320 inlet on the rear panel. Specifications apply at the 1 PPS output, in the presence of Selective Availability (SA), as of date of publication. Twelve (12) channel, C/A code (1575.42 MHz). Receiver simultaneously tracks up to twelve satellites. Results from all tracked satellites are averaged in Position-Hold Mode or, with Position-Hold Mode off, using least-squares estimation. Two standard: one IRIG-B Unmodulated and one 1 PPS; Type: bus driver, 5 V CMOS; 10 ohms source impedance; ±75 mA drive capability; pluggable terminal strip. One programmable output pulse (by a jumper connection) that may be output on a terminal strip connector or the AUX OUT pin on either RS-232 Port. Pulse duration is programmable from 0.01 to 600 seconds, except in one-shot mode, where the output is Low prior to the specified time and High thereafter. Size: 1 RU rack mount or tabletop, 260 mm deep FMS, Rack mounts included.